Mix and Chic: Making a huge visual impact using a single quirky and interesting object. Making a huge visual impact using a single quirky and interesting object. 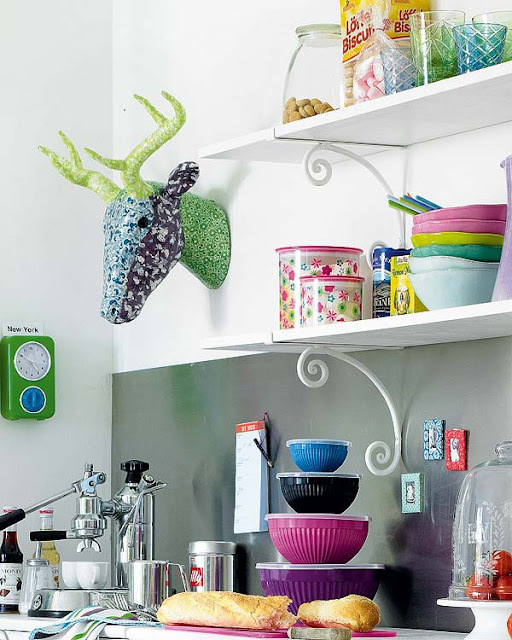 A huge faux papier-mache deer head mounted on a wall creates a sense of quirkiness, fun and whimsy in a cheerful kitchen filled with colorful bowls, vintage glass stemwares and accessories. In a casually elegant living room filled with button tufted sectional sofa, leather club chairs, wood coffee table, vintage Italian pendant lamps and a neutral sisal rug, a vintage American Boneshaker bicycle hung above the fireplace instantly becomes a focal point in an unexpected way.